The St. John's Red Storm men’s basketball teamm signed rising sophomore David Caraher, who previously starred at Houston Baptist and was named the 2017-18 Southland Conference Freshman of the Year, on Monday. The 6-foot-6, 220-pound forward from Chapel Hill, N.C., averaged a team-high 16.2 points and 7.2 rebounds per game in 2017-18, starting all 29 of his appearances for the Huskies. A Third Team All-Southland Conference honoree, Caraher finished fifth in the league in scoring and seventh in rebounding during his rookie campaign. Caraher’s scoring average last season ranked 12th among Division I freshmen and was the highest in the Southland Conference for a rookie in over a decade. Caraher scored in double figures 23 times and reached the 20-point plateau on 10 occasions in 2017-18. He twice exploded for 30 points, once against University of Texas at San Antonio in December and again a month later against McNeese. Caraher also finished second on the team with 56 threes and shot 73.6 percent at the free-throw line. During Southland Conference play, Caraher upped his scoring to 18.1 points per game, the fourth highest average in the league. In addition, he finished fifth in the conference with 7.6 rebounds per contest in league action. Prior to Houston Baptist, Caraher was a two-year starter at Wesleyan Christian Academy in High Point, N.C., where he played for head coach Keith Gatlin. As a senior, he collected First Team All-State honors after averaging 17 points, eight rebounds and four assists per game. Caraher was named to the Honor Roll at Wesleyan Christian Academy and was a member of the National Honor Society and National Beta Club. He played AAU ball for Team Charlotte under head coach Jeff McInnis. 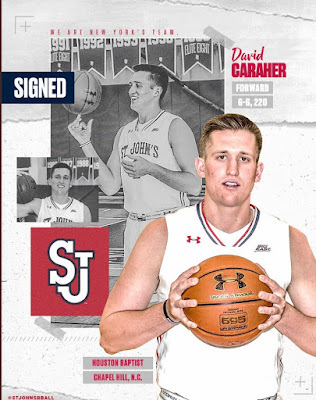 Caraher is the second player to commit to St. John’s in the past week, joining incoming freshman forward Marcellus Earlington, who signed with the Red Storm men’s basketball program on Thursday. The Johnnies will also welcome first year players Greg Williams Jr., a four-star guard from Louisiana, and Josh Roberts, a 6-foot-9 forward from Alabama, who pledged to St. John’s during the NCAA Early Signing Period. Books: "The Home For Unwanted Girls"
Books: Lee Goldberg's Reality In "True Fiction"